More information about the American Pit Bull Terrier 2013 Pocket Planner. "American Pit Bull Terrier Pocket Planner: These intelligent dogs are loyal, gentle, and courageous. Because they are confident, eager to please, and affectionate, Pit Bulls can make excellent family companions, and they get along tremendously with children they know well. Enjoy this wonderful canine all year long with this pocket planner that features a doggy image on each page. This softbound, two-year (2013 ? 2014) planner is an essential for portable monthly and long-range planning. 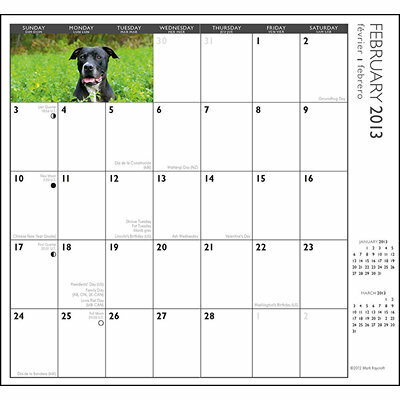 Unfolding from a convenient 3.5"" x 6"" size into a 7"" x 6"" monthly calendar grid, this format is only slightly larger than a checkbook and fits perfectly in pocket or purse. Notable features of this planner include a striking wraparound cover image, planning pages for 2015 and several additional pages for notes. EAN: 9781465003034"